Paul Ryan’s marathon myth: Does it matter? Does it matter that Paul Ryan claimed to have run a 3-hour marathon? Photograph by J.D. Pooley/Getty Images. 3:58:44. That is my marathon time—New York City, 1983. And I have a picture to prove it. Sub-4 hours, but not even close to sub-3. And I am proud of it anyway, and will never forget it. Marathoners—especially those who have only run one—never forget their times. We now all know that even in the long line of Paul Ryan distortions, his claim of a sub-3-hour marathon ranks as among the most stupid. It was easily and quickly proved to be no more than the grandiose claim of somebody at least slightly out of touch with reality. Let’s be clear what the difference is: A sub-4-hour marathon is possible for a determined but not-too-talented runner. Sub-3 requires real talent. 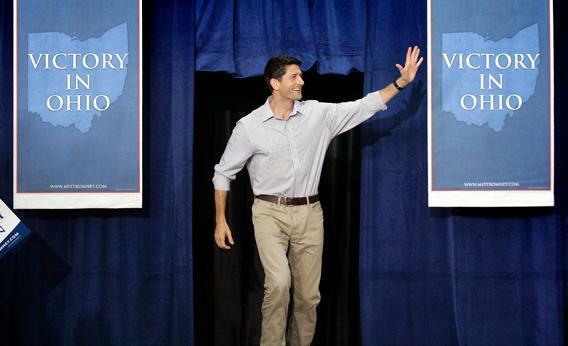 Ryan’s problem is that he is about to become as phony as the proverbial $3 bill—or 3-hour marathon time. His dissembling about the marathon fits the same pattern as his claims about deficits, taxes, his role in Bowles-Simpson, and the alleged Obama Medicare cut. He bends numbers and facts when he wants to, merely to confirm his theological views. Facts are malleable: They can be molded and spun, with the assistance of a media willing to repeat them loudly enough that the objective truth simply gets drowned out. And let’s not forget that Ryan is the purported “wonk” of the Republican Party, the truth-teller, the numbers guy. Really? None of this will matter if the Obama campaign can’t answer the all-important question—Are you better off now than you were four years ago?—in a smarter and snappier way than it did over the weekend. The answer, of course, is that we are. But if the president and his surrogates can’t show us that we are—with enough numbers to be clear that this is an objectively provable answer—and then explain that we are also heading in the right direction, then Ryan’s 3-hour marathon myth may yet succeed. Watch Eliot Spitzer, Paul Ryan, Sarah Palin, and more race against each other in an epic political marathon clash. Also listen to Stefan Fatsis, Josh Levin, and Mike Pesca discuss Paul Ryan and marathon fraud on this week’s episode of Slate’s sports podcast Hang Up and Listen.